Reference evapotranspiration (ET) and rain in the Upper Republican NRD was around 1.3 and 0.05 inches, respectively. 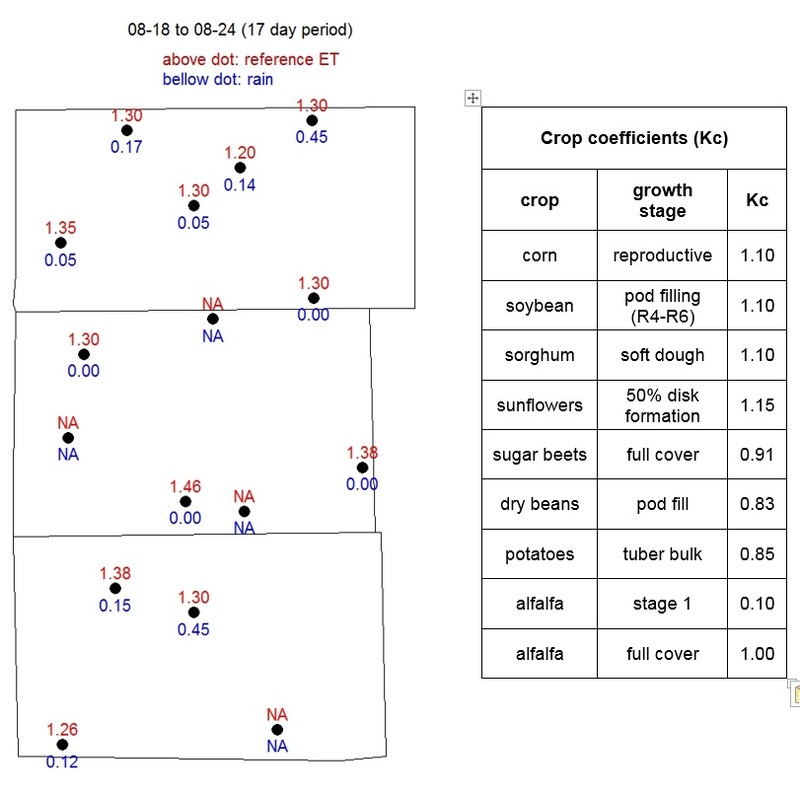 See attached image for more details on ET and rain data as well as crop growth stages and their water use coefficients for this period. Dryland crops in SW Nebraska are showing signs of drought, but are generally in good conditions. My rough estimation on average dryland corn yield this year would be around 110 bu/ac. Irrigated corn and soybean look very good! Relatively lower ET allowed irrigators to catch up with crop water demand. 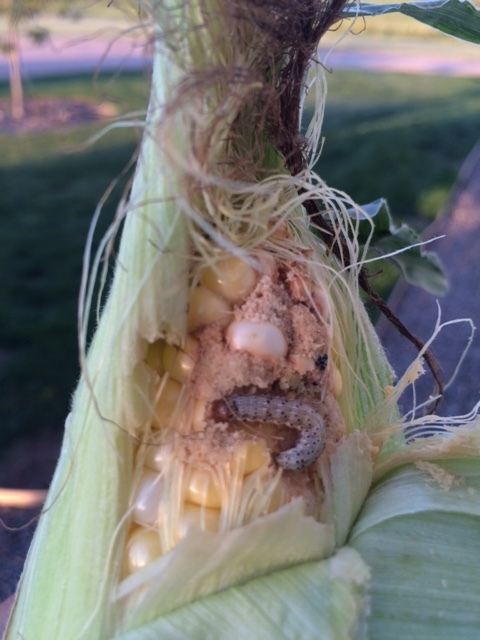 A number of corn fields have high infestations of western bean cutworm with larvae already feeding on ears. Insecticide treatments are not advisable at this point since pest is well protected. If corn is to be planted next year consider Bt-trait that will control (or suppress it) or plan on insecticide application during the season. Western corn rootworm beetles are flying and insecticide application may be applied to prevent battles from laying eggs and reduce next year’s larvae damage. If corn is rotated with some other crop insecticide application is not recommended at this point. 1. 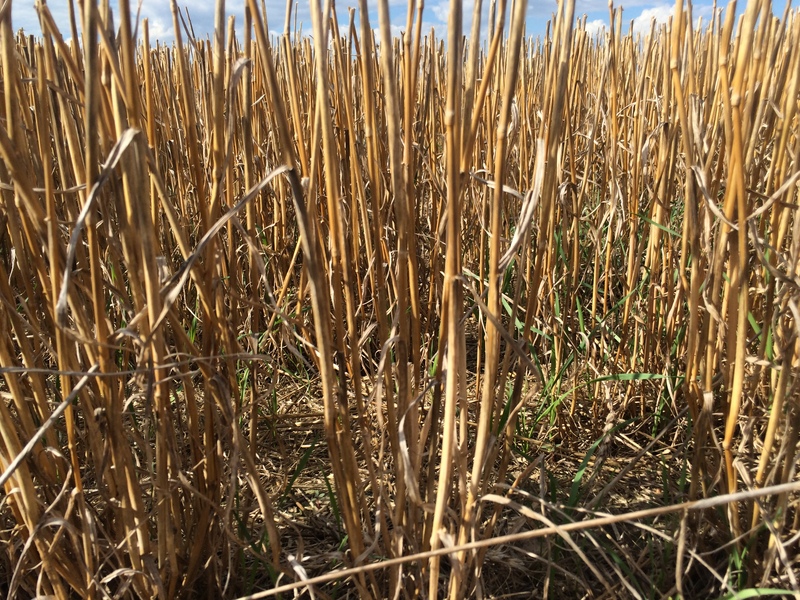 Control volunteer wheat and weeds in wheat stubble and fallow to preserve moisture and nutrients, reduce the weed seed bank and control disease vectors. Research from USDA‐ARS, Central Great Plains Research Station in Akron indicates 4-6 bu/ac yield penalty on wheat for each inch of available soil water being reduced at wheat planting. Nutrients taken up by weeds and volunteer wheat can increase the cost of your fertilizer inputs. 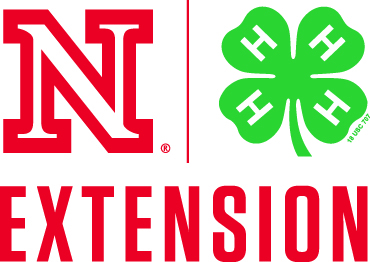 Simple calculation for estimating your wheat fertilizer needs based on fertilizer and wheat price, residual soil nutrients and yield goal can be found at UNL Extension website. Wheat Streak Mosaic Virus (WSMV) disease is transmitted by the wheat curl mite (WCM) and “green bridge” provides host plants for both virus and mite to survive and cause problems next year. Mace is wheat variety tolerant to WSMV and you should consider it if you had a history of WSMV in your field. Recommendation: Tank-mixtures of glyphosate with 2,4-D or dicamba, or gramoxsone are usually very effective in controlling “green bridge”. Two applications might be necessary in some cases, but avoid applying these chemicals 2 weeks prior to planting to avoid herbicide injury. 2. Consider buying certified, fungicide-treated seed to prevent yield losses from seed- and soil-borne pathogens and eliminate germination and survival problems that may be associated with planting bin-run seed. Lover test weights were reported this year from a number of producers that did not sprayed for stripe rust. Wheat leaves that were severely infested with stripe rust fell off prematurely and imposed a stress on wheat crop during the grain filling period. K-state researchers found that planting seed with lower than 55 lbs per bushel may require special attention such as shallower seeding depth, higher seeding rate, adjusting seed blower to blow out “chaffy” seeds, and germination test. For more information click here. Seed-borne diseases including Black Chaff, Fusarium head scab and ergot observed in this year’s wheat crop. Soil-borne diseases including root, crown and foot rots are common if soil conditions are wet during germination period and yield losses can occur due to poor establishment. Click here for more information. Recommendation: Plant certified, fungicide treated seed. If using bin-run seed send seed to a lab for germination test or do the germination test yourself by wrapping seeds in wet paper towel for 5-7 days and estimating percent that survived. If germination rates are less than 80% fungicide treatments are highly advisable. For list of fungicide seed treatments click here. 3. Variety selection is critical part of every cropping systems. This doesn’t necessarily mean to select highest yielding variety from the book and expect highest wheat yield in the county. We need to become more familiar with other characteristics such as winter hardiness, disease tolerance, maturity, etc. For example, Byrd is one of the highest yielding varieties commonly planted in SW Nebraska, but it is very susceptible to stripe rust; therefore, you need to be tracking progression of stripe rust throughout the season and be ready to spray preventively. This year $20/ac investment on spraying stripe rust on Byrd made approximately 30 bu/ac yield difference. For Nebraska Extension Fall Seed Guide click here.